Raj and Sangita Shah live in Duluth, Georgia, now, but both come from middle class, working families in Gujarat, India. Sangita came to the U.S. as a teenager with her parents in 1978. After high school, she attended Rutgers University, where she earned a degree in accounting and finance. Raj completed his master’s degree in business at Baroda, India, and came to the U.S. in December of 1982 to pursue another master’s degree in computer science at Cleveland State University. Raj and Sangita met while living in the States, and were married in New Jersey in October 1988. 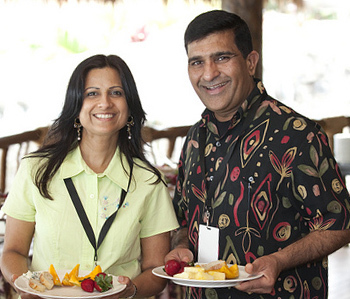 They both worked for the same corporation, Raj as a software engineer and Sangita as an accountant. They were doing well in their professional careers, but they were not satisfied with the routine. Then in 1990 they decided to pursue an opportunity to start their own business. Raj had always wanted to own his own business, to be his own boss, and give his wife the choice of being a full-time mother when they had their family. They decided to focus their efforts on building their business to make these dreams come true. In April 1992, Sangita was able to quit her job to be a full-time mom and then in 1994, Raj ended his seven year career as a computer engineer. Today, the Shahs continue to run a very successful business and are full-time parents, spending quality time with their three children, Ronak, Reena and Riya. As the Shahs have achieved success in their marketing business, they also enjoy helping others and have given their time and energy supporting worthwhile charities. They are especially active in supporting Easter Seals and the U.S. Dream Academy due to the programs these organizations have developed to meet the needs of children and returning veterans. The Shahs truly understand the value of helping others and have made it a priority in their lives. The Shah’s believe that hard work, a great attitude, a clear vision and determination are the keys to success. After more than 20 years, they are still actively building their business by helping and empowering others to follow their dreams.